Haven't been posting much cause I am on vacation! 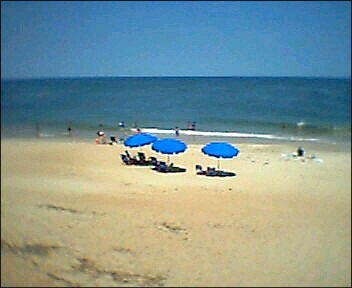 Down North Carolina way, Outer Banks or OBX as it is referred to here. Playing more with Typepad is at the top of my list for my return to civilization (read broadband) although it is doing quite well over my dialup access at our beach house. I have been shooting primarily with a variety of digital cams, an old Olympus D-100, a Nikon Coolpix 990, and a Canon Powershot S200 Elph. My absolute favs have been my phonecams, however, a Sidekick and a Sanyo 8100. For me, the Sanyo is the second coming of the Diana and seems to be on the verge of a similar cult following. It has quickly outpaced its better-featured sib, the 5300 - going from zero to picture ready with just two touches. The dominant form-factor of photography, basically unchanged since Cartier-Bresson picked up a Leica, is changing right now. These are exciting times to be a visual artist.